Matt Pope wanted to make his parents happy and become a lawyer. But after finishing his undergraduate studies at Texas State, he got a temporary job tutoring elementary school kids in an at-risk school in South Texas. Almost instantly, Matt was hooked on a new career. He was soon enrolled at the University of Houston to get a teaching certificate and ultimately a master’s degree in education. “I realized I loved the kids and I wanted to be able to change people’s outcomes before they needed a lawyer,” says Pope. Today, Pope, 33, is changing outcomes for kids throughout Central Texas as senior program director of RAISEup Texas, an initiative that is transforming teaching and learning in area middle schools. It’s a job he took after teaching math for a few years and later becoming principal of Simon Middle School in the city of Kyle. 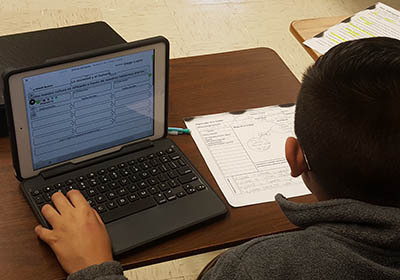 The school was one of six participating in a RAISEup Texas demonstration project led by E3 Alliance, a data-driven education partnership based in Austin and a nationally recognized collective impact model. Under Pope’s leadership and with RAISEup Texas’s support, Simon Middle School went from being on the state watch list for underperformance to ranking in the top 25 percent of middle schools in the state in closing performance gaps for struggling students. Among many accolades, the school was named a “2014 National School to Watch” by the National Forum to Accelerate Middle-Grades Reform. The accolades and the improvements in student performance are all the more impressive considering that Simon Middle School serves a high concentration of struggling students; more than 90 percent receive free and reduced-price lunch and nearly half are English-language learners. No matter their background, students who come to school hungry lack the energy and focus required to concentrate in the classroom. Inspired by the results his school achieved with the support of RAISEup Texas, Pope responded enthusiastically when he was approached by E3 Alliance about leading a region-wide expansion of the program. In national conversations about improving education and getting better results for all kids, the middle school years often get ignored. Education experts, government officials, businesses and investors pay a lot of attention to the outside ends of the cradle-to-career continuum, avoiding some of the tough challenges involving schools, teaching and learning. There is growing investment in and attention to the importance of quality preschool so kids are ready to learn when they start kindergarten. At the other end, school districts are exploring a range of evidence-based strategies for creating clearer pathways from high school to college and careers. Sadly, the middle school years also are years when far too many students start falling through the cracks. In a reflection of national data, research by RAISEup Texas found that passing rates on standardized tests among Central Texas students dropped by 20 percentage points between fifth and ninth grade, and student disciplinary referrals tripled between fifth and sixth grade. “The data showed what a lot of people already believed to be true: the middle school years weren’t working for our students,” says Susan Dawson, president and executive director of E3 Alliance. It was this belief — and the data behind it — that prompted E3 Alliance to seek a grant through the U.S. Department of Education’s Investing in Innovation (i3) program for a large-scale effort to transform teaching and learning in middle schools in the region. Although its proposal placed in the top 5 percent of nearly 1,700 submitted nationwide, E3 Alliance did not win the grant. Determined to move forward nonetheless, E3 Alliance launched RAISEup Texas as a three-and-a-half year demonstration project starting in January 2011. The focus: implementing an evidence-based model for “whole-school transformation” in six middle schools serving 13,000 students. 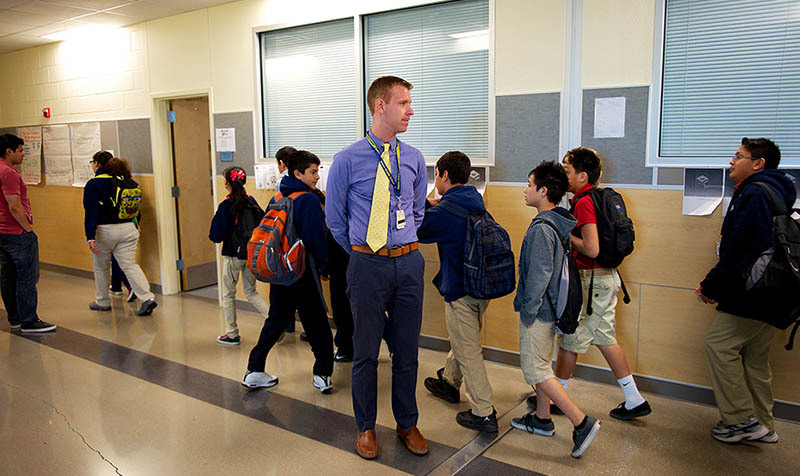 When the RAISEup Texas demonstration project launched, Matt Pope was assistant principal at Simon Middle School, located along the bustling I-35 corridor between San Antonio and Austin. 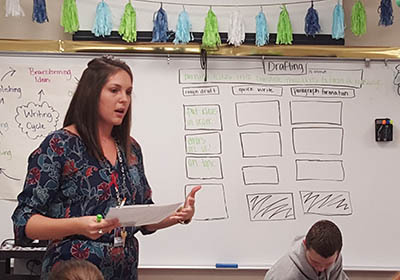 In Simon and the other five schools, RAISEup Texas set out to work with teachers and staff to apply the Strategic Instruction Model (SIM) developed by the University of Kansas Center for Research on Learning. 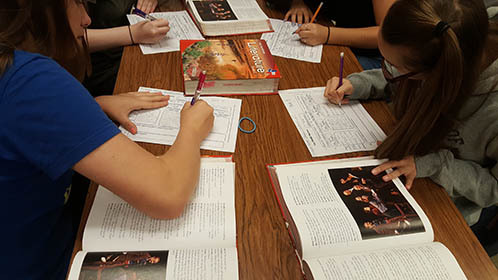 Through intense, multi-year professional development and coaching for teachers, SIM provides powerful teaching tools and strategies for supporting students to develop content literacy across all of their classes. During the first year of the demonstration, administrators and teachers at Simon Middle School struggled. “Honestly, we didn’t know quite what we were doing, and people were frustrated that this was just one more initiative they had to pay attention to on top of everything else,” Pope says. But Pope was undaunted. When he was promoted to principal at the end of that year, he decided that the school needed to, as he puts it, “go all in.” This meant transforming existing structures and systems at the school so everything was designed to support the SIM model to succeed. Pope built dedicated time into the school day for teachers and staff to meet with each other to share what’s working and what’s not, and also to meet with the instructional coach provided to each school by RAISEup Texas. And he doubled down on a process called “SMARTER Planning” so that teachers could map critical content, evaluate student learning and adjust strategies based on different students’ needs. Before long, the data began to back up what Pope was seeing every day. Simon Middle School went from having the worst attendance numbers in the district to having the best. Student disciplinary referrals started to decline. The results were especially striking for struggling students who attended the new “Learning Strategies” classes that are part of the SIM model. Three out of five of these students (60 percent) moved to grade level in one year, making two to three years of gains in nine months. The results at Simon Middle School were echoed at the other schools in the RAISEup Texas demonstration. The Texas state accountability system for schools includes an “Index 3” distinction for campuses that demonstrate they are closing performance gaps across different demographic groups. Among all central Texas middle schools, the proportion receiving this distinction in 2014 was one in four (25 percent). Among the RAISEup Texas demonstration schools, it was 75 percent. RAISEup Texas research showed that students in the six schools registered 10 times as many point gains on standardized tests compared to peers across the country who started at the same level. With evidence in hand that the demonstration project created impressive results for schools and students, RAISEup Texas, now under Pope’s leadership, developed a business plan for expanding the work to more schools in the region. Eight new schools began the three-and-a-half year journey in the spring of 2015, and another cohort of schools launched in the spring of 2016. Over the next five years, Pope says RAISEup Texas will reach an additional 28,000 students through these two cohorts, and 1,100 teachers will gain powerful skills they can use to benefit students for decades. 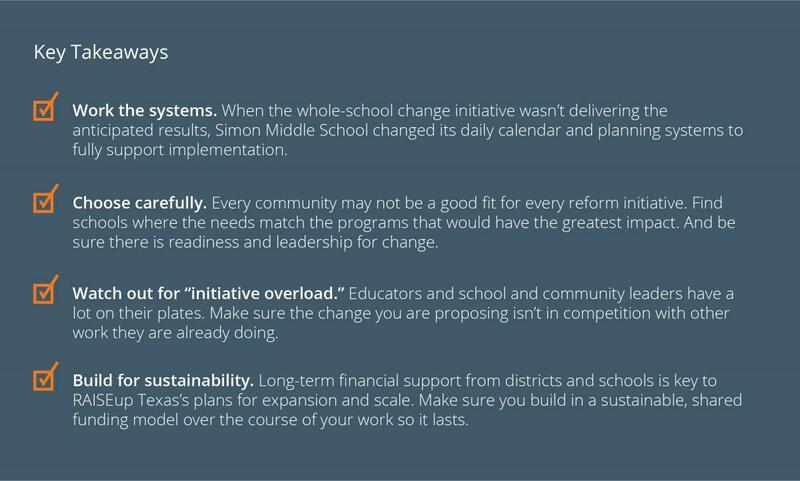 As RAISEup Texas writes the next chapter in its path to large-scale impact, it is applying lessons learned during its early work with Simon Middle School and the other five demonstration schools. Having seen the impact that the SIM model can have in improving outcomes for struggling learners, the expansion is focused on schools with large populations of struggling learners. The expansion also relies on a shared funding model where RAISEup Texas’s private investors cover 100 percent of the early costs, but school districts then start picking up more and more of the costs over time until the changes are fully sustained with public funding. “We want to see schools and districts really buy into this over time so it becomes sustainable and an accepted way of operating. The expansion is designed to make that happen,” says Pope. RAISEup Texas also has been very deliberate about selecting schools for the expansion where it feels leaders and teachers are ready to take on the challenge of whole-school transformation. “Not every school is going to embrace this. You are talking about massive change for everyone in the building,” says Pope. In its negotiations with participating schools, E3 Alliance has district leaders and school principals sign a 20-page agreement spelling out expectations and the logic model for the program. “I know what it’s like to make this commitment. I’ve been there so I want to make sure people understand what it takes,” says Pope. But Pope also wants people to understand the rewards that come from transforming teaching and learning for students in their middle school years. “There is nothing better than seeing your work result in real changes in kids’ lives,” he says. RAISEup Texas is an initiative of E3 Alliance, a StriveTogether Cradle to Career Network member and a nationally recognized nonprofit located in Austin, Texas. Founded in 2006, E3 Alliance is working to build the strongest educational pipeline in the country to drive regional economic prosperity.